The Emitters tab (see below), as its name implies, is used to set the parameters of the sources emitting the particles. The center of the emitters is shown in green, its shape is marked by red dots. The purple handles describing the shape of circular arcs indicate the angle at which the particles are projected. We will study them in detail when discussing the Emitter > Current tab. Below, the smoke coming from the steam engine was created using a Point type emitter. Above, a zoom on the HUD. It is possible to work with several emitters, placed where you want. 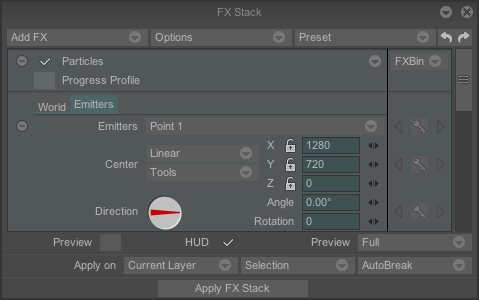 The Emitter popup menu will facilitate your task as it offers you the possibility to Create, Rename, Delete and Duplicate emitters (note that the name of the emitter you are working on is displayed in the header of the popup menu). Using several emitters may be useful when, for example, you wish to animate a building starting to burn: with several emitters, fire and smoke may come from several windows or chimneys with varying intensity (see below). All these types of emitters have a center that you may place wherever you wish using the X, Y and Z coordinates (the « Z » coordinate is used to set the depth parameter as you have already seen when studying the Keyframer). The Tools and Interpolation (Linear, Spline or Smooth) popup menus are used to define the path to be followed by your emitter source in time. By clicking on the little padlock buttons, it is possible to "lock" your emitters in space so that they cannot be moved along the axis (or axes) of your choice. This enables, in particular, avoiding untimely movement. The locked points may be subject to animation keys and "intermediate" points in time may be created from the locked points. The Angle option is used to point the emitter in the direction of your choice. It is also possible to turn your emitter using the animation key system. The Rotation parameter is used to manage rotations of more than 360°. Some settings, not shown above, are specific to the emitter you choose to work with. Depending on the emitter chosen these are: length of the line, length and width of the rectangle, size of the two ellipse axes. You will note that, once the emitter is created, two tabs appear: the Current tab and the Particles tab.